Nursery Rhymes are great to explore in the Spring. This week, I am sharing lots of favorite Nursery Rhymes along with Easter ideas for kids. If you missed the first few days of the series, you can find all of the Nursery Rhymes in this round up post. Today I am sharing Baa Baa Black Sheep. Springtime is a fun time to explore sheep, but this activity would work well for any time of year! 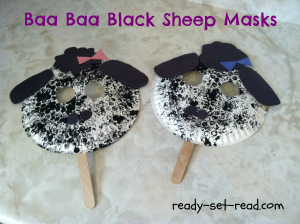 We made these black sheep paper plate craft to retell the nursery rhyme. We began by bubble wrap stamping our paper plate. 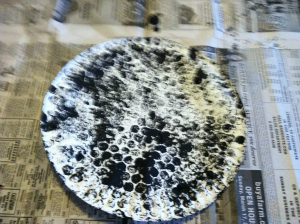 We just painted bubble wrap black and stamped it all over the paper plate. Speaking of bubble wrap painting check out the awesome one on my facebook page. If only I could master that kind of artistry! When that dried, we attached the ears, puff of hair, nostrils, and bow. I had precut the ears (ovals), and the puff of hair (cloud shape) and 2 circles for the nose. We added the bow (2 triangles) later-- after I convinced the boys that their sheep would look cute with bows. They weren't too sure at first. To make eye holes, I held the mask up to my face and pushed in on my eyes. This creased the paper a little so I knew where to make eye holes. 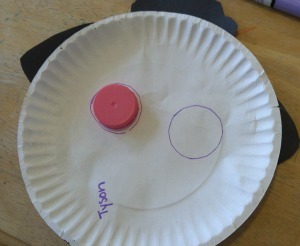 Then I flipped it over and traced a milk cap and cut the circle. 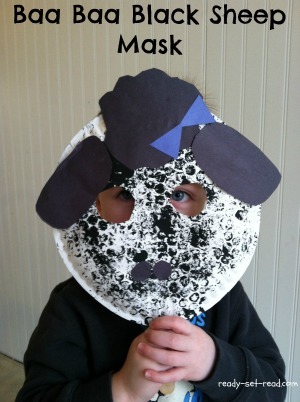 We taped a popsicle stick to the sheep paper plate to make it into a sheep mask. This is perfect for retelling the nursery rhyme. I hope you are enjoy these Nursery Rhyme activities. 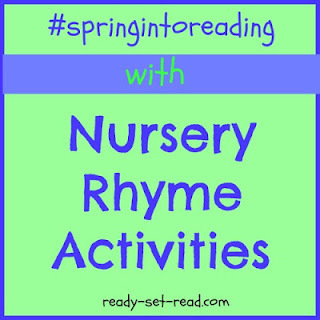 You can find the 5 day series of Nursery Rhyme Activities right here at Ready-Set-Read!